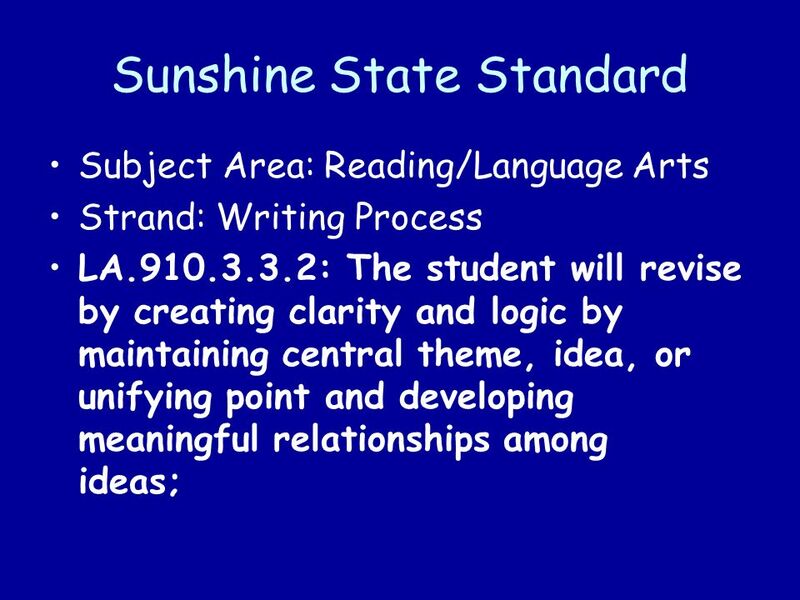 Slow Way Home: Unit II Lesson 4 Slow Way Home Chapter 8 Developing Support in Persuasive Writing Milinda Jay, Ph. 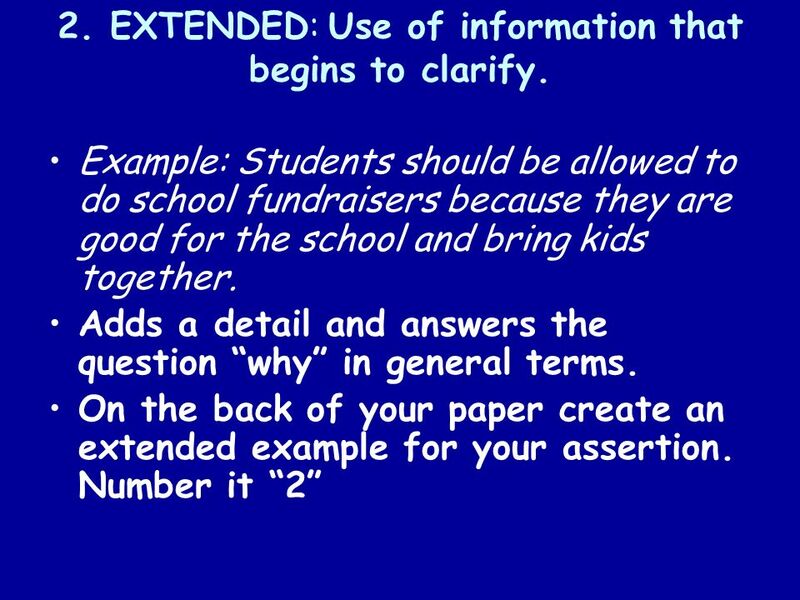 D.
2 For teachers only This lesson is an important one in that FCAT scoring relies heavily on the extent of the students ability to support his topic. Students with elaborated support consistently score in the 4 and over range. Those with only bare and extended score in the three and under range. 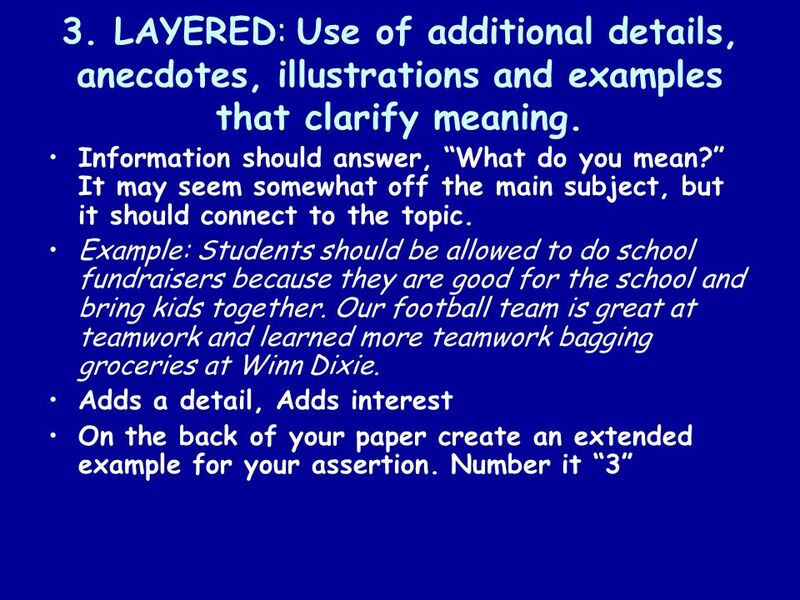 Enabling your students to understand and then create multilayered reasons for their ideas will help them in all of their writing. 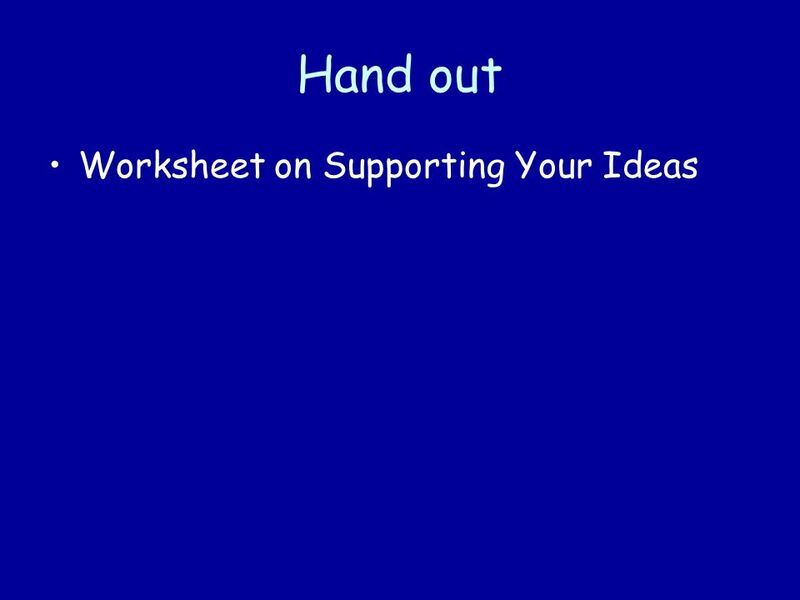 Have Word Document: Supporting your Ideas ready to hand out on slide 16 Students will have a contest in which they vote on which group has the best example for each support type. Prizes would be lovely! 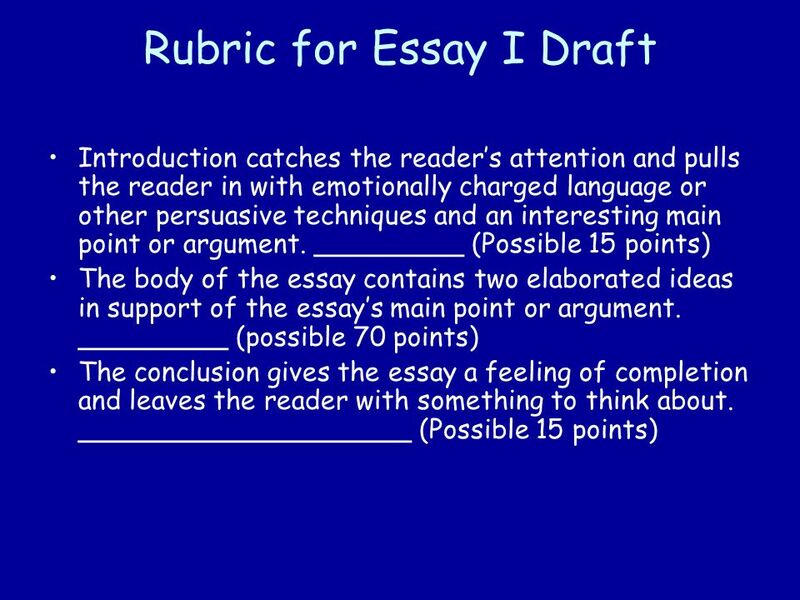 Have Writing Rubric for first Essay ready to hand out on slide 31 This lesson contains the assignment for the first summative essay grade. The assignment is on slide 30. 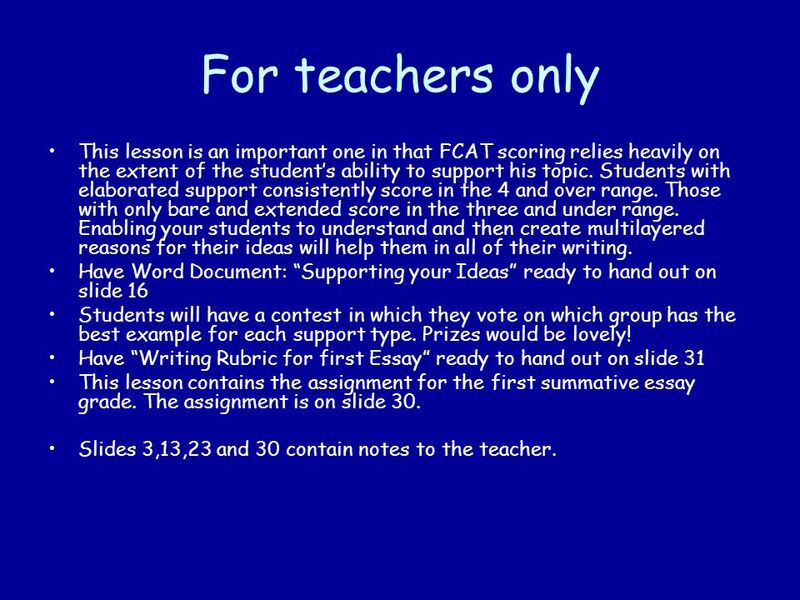 Slides 3,13,23 and 30 contain notes to the teacher. 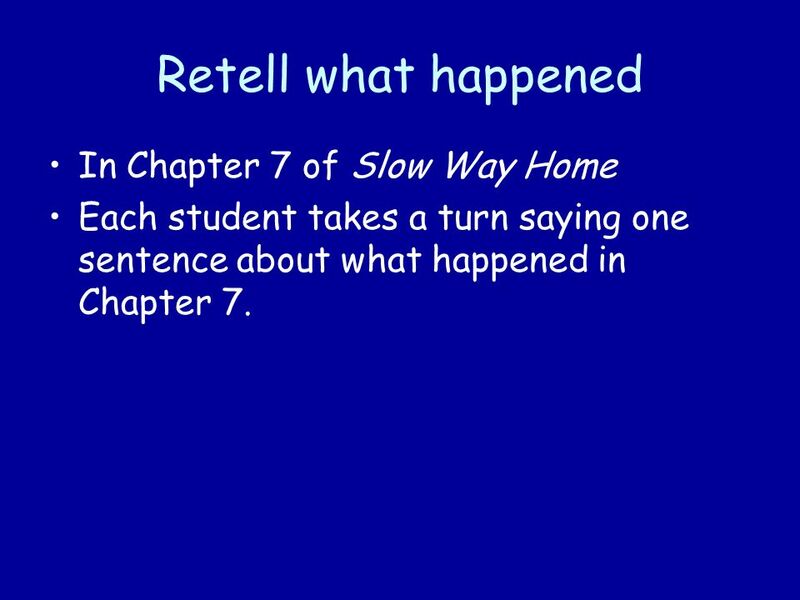 3 Retell what happened In Chapter 7 of Slow Way Home Each student takes a turn saying one sentence about what happened in Chapter 7. 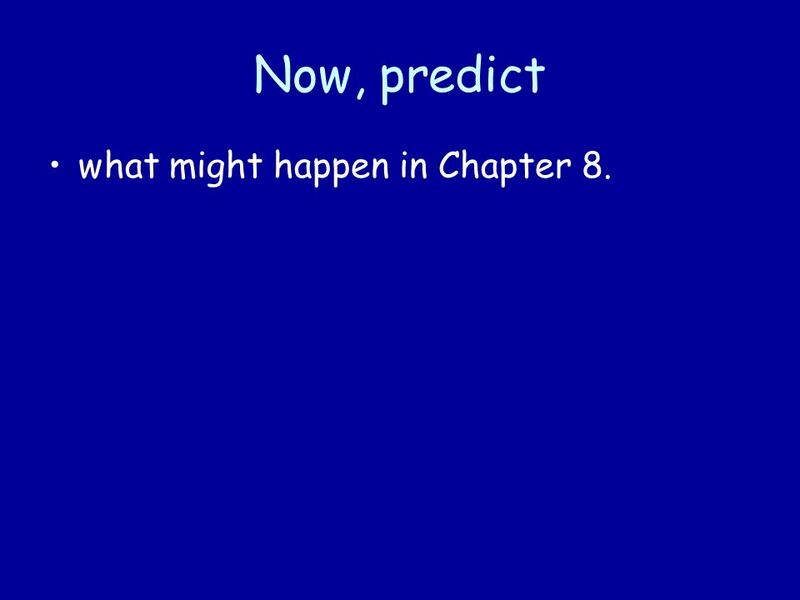 4 Now, predict what might happen in Chapter 8. 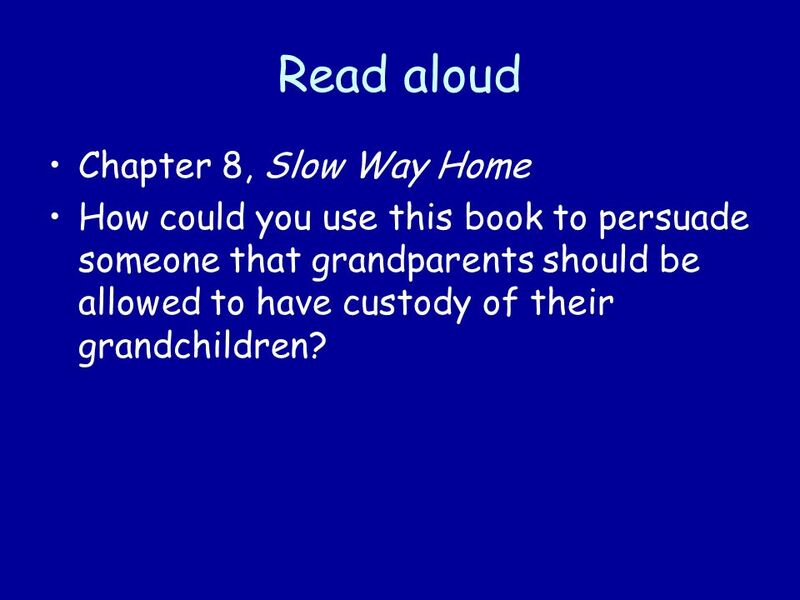 5 Read aloud Chapter 8, Slow Way Home How could you use this book to persuade someone that grandparents should be allowed to have custody of their grandchildren? 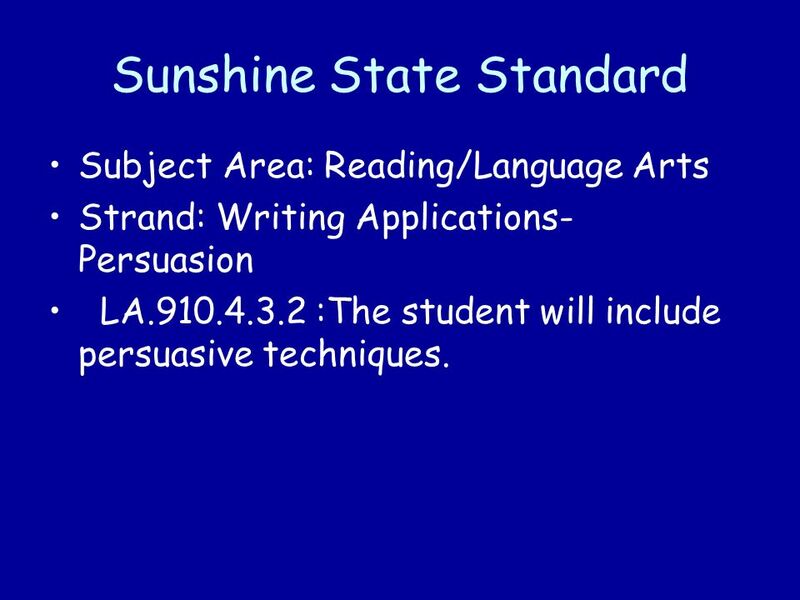 8 Sunshine State Standard Subject Area: Reading/Language Arts Strand: Writing Applications- Persuasion LA.910.4.3.2 :The student will include persuasive techniques. 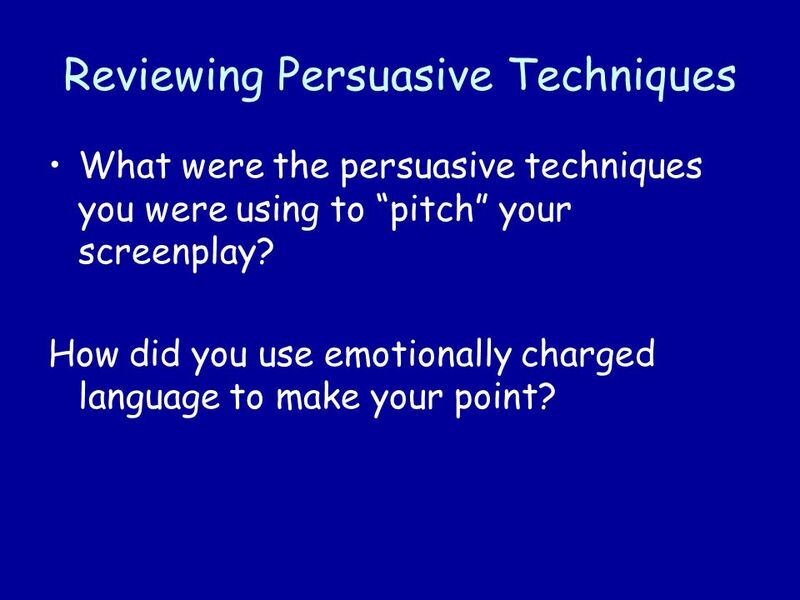 10 Reviewing Persuasive Techniques What were the persuasive techniques you were using to pitch your screenplay? How did you use emotionally charged language to make your point? 11 Prompt Persuade judges to give grandparents the ability to gain only temporary custody of children whose parents have either abused them or have allowed them to be abused. 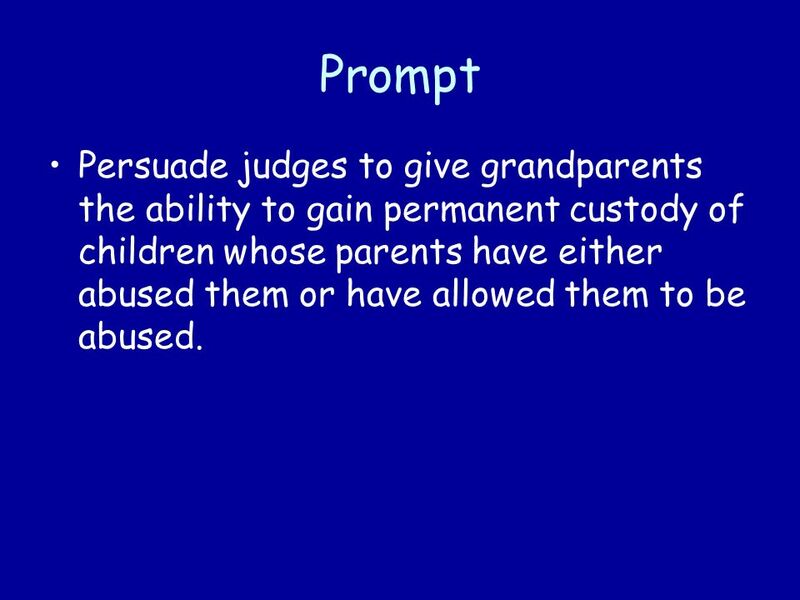 12 Prompt Persuade judges to give grandparents the ability to gain permanent custody of children whose parents have either abused them or have allowed them to be abused. 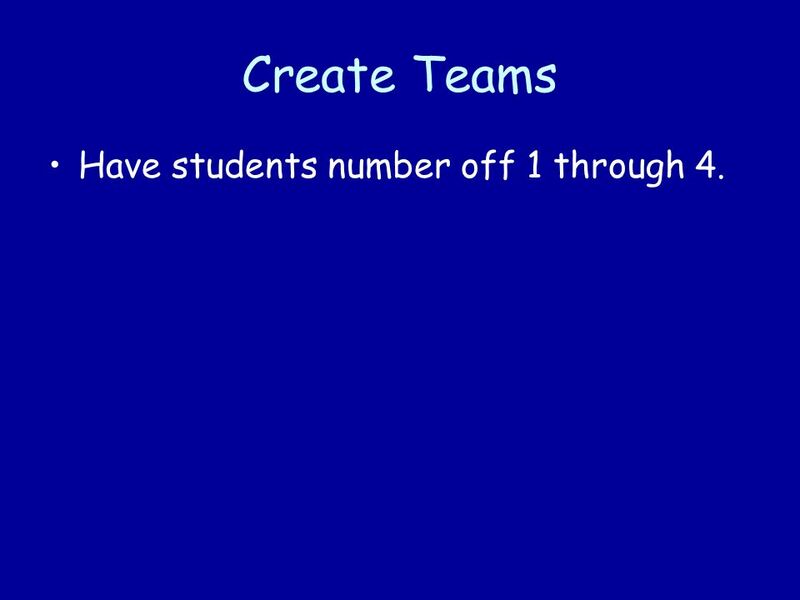 13 Create Teams Have students number off 1 through 4. 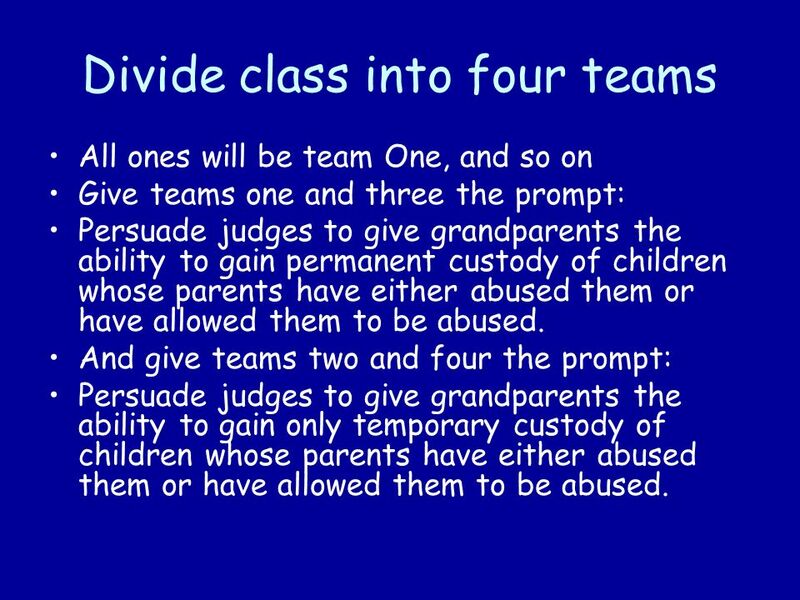 14 Divide class into four teams All ones will be team One, and so on Give teams one and three the prompt: Persuade judges to give grandparents the ability to gain permanent custody of children whose parents have either abused them or have allowed them to be abused. 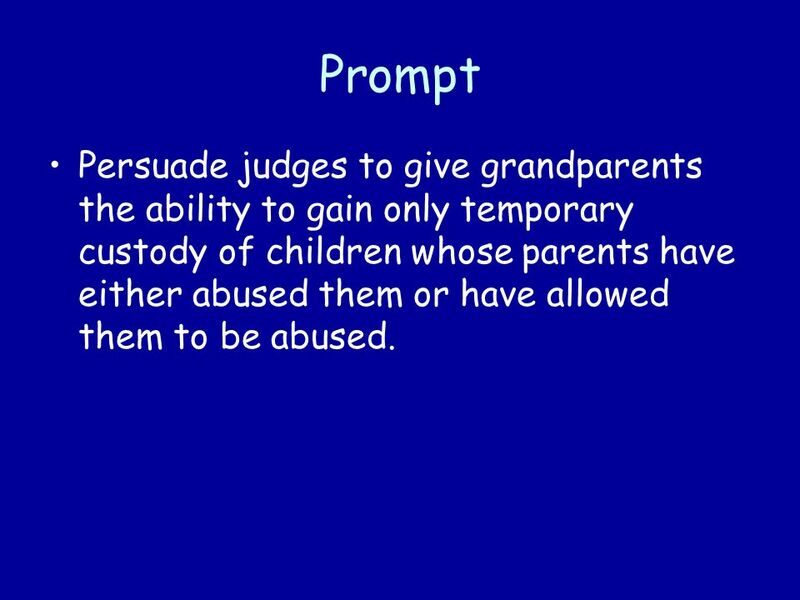 And give teams two and four the prompt: Persuade judges to give grandparents the ability to gain only temporary custody of children whose parents have either abused them or have allowed them to be abused. 15 Have each team Come up with two reasons why their prompt is true. 17 Types of Support Practice: on the back of this paper, number 1-4 and present a bare, extended, layered and elaborated assertion for the persuasive essay prompt your group is working on. Your teacher will guide you in understanding each of the four types. 18 Work independently then share your answers with your group. 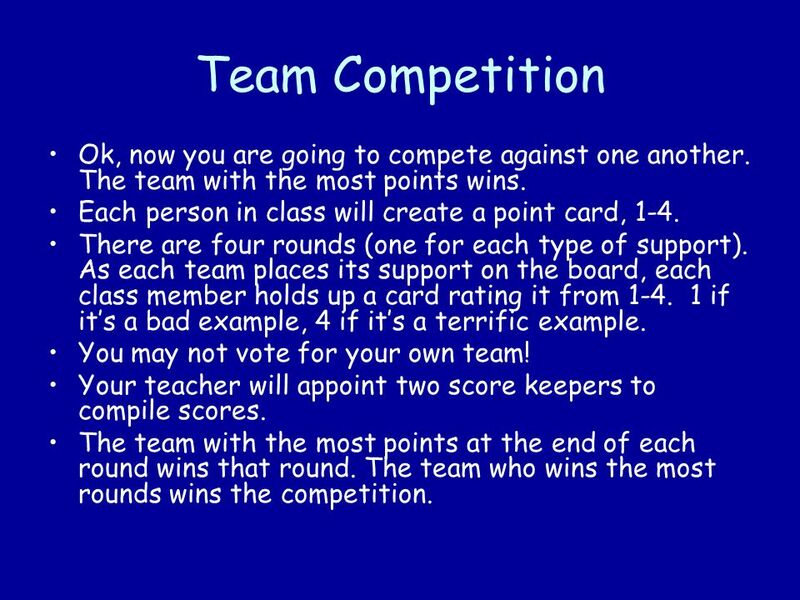 Your group can then determine which support works best for the class competition. 23 Team Competition Ok, now you are going to compete against one another. The team with the most points wins. Each person in class will create a point card, 1-4. There are four rounds (one for each type of support). As each team places its support on the board, each class member holds up a card rating it from 1-4. 1 if its a bad example, 4 if its a terrific example. You may not vote for your own team! Your teacher will appoint two score keepers to compile scores. The team with the most points at the end of each round wins that round. 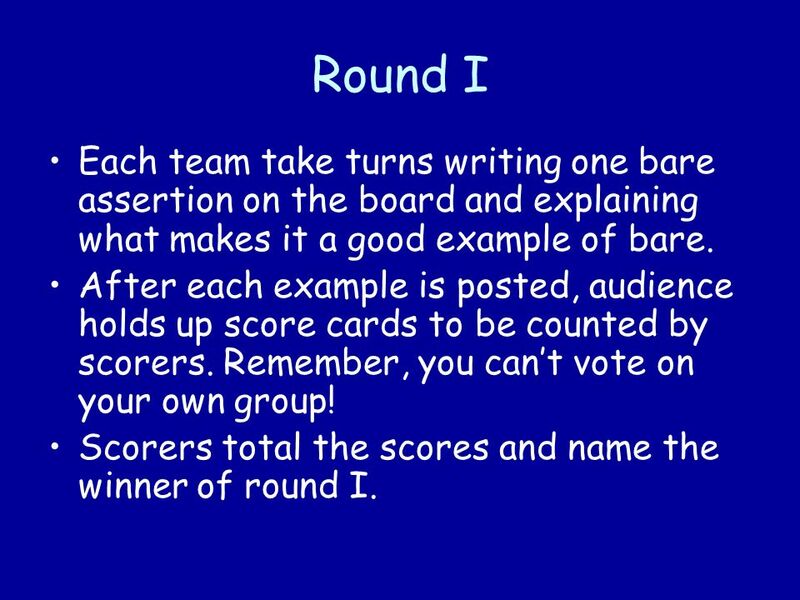 The team who wins the most rounds wins the competition. 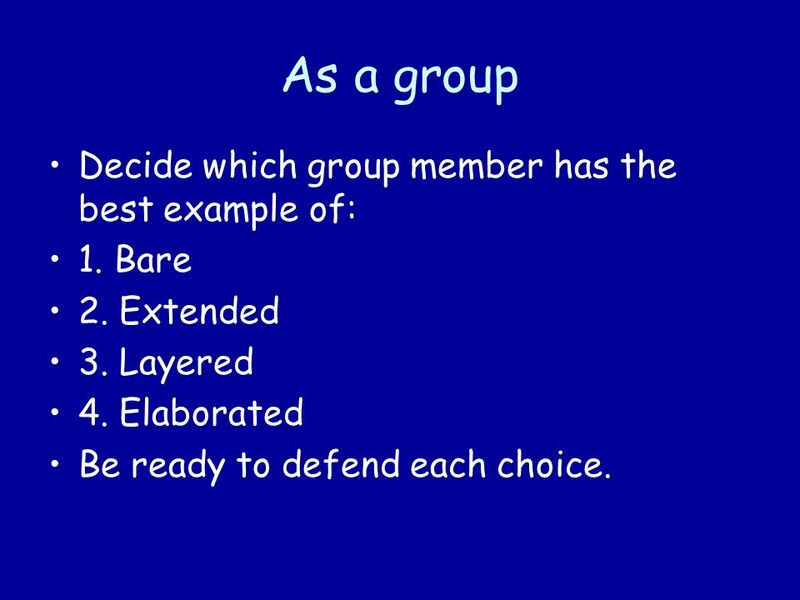 24 As a group Decide which group member has the best example of: 1. Bare 2. Extended 3. Layered 4. Elaborated Be ready to defend each choice. 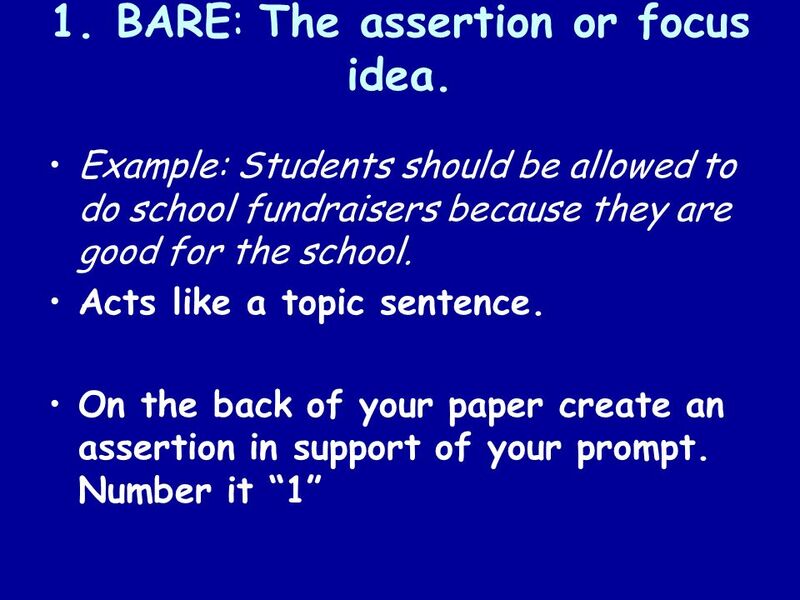 25 Round I Each team take turns writing one bare assertion on the board and explaining what makes it a good example of bare. After each example is posted, audience holds up score cards to be counted by scorers. Remember, you cant vote on your own group! Scorers total the scores and name the winner of round I. 26 Round II Each team takes turns writing their best extended example on the board. After each example is posted, audience holds up score cards to be counted by scorers. Scorers total the scores and name the winner of round II. 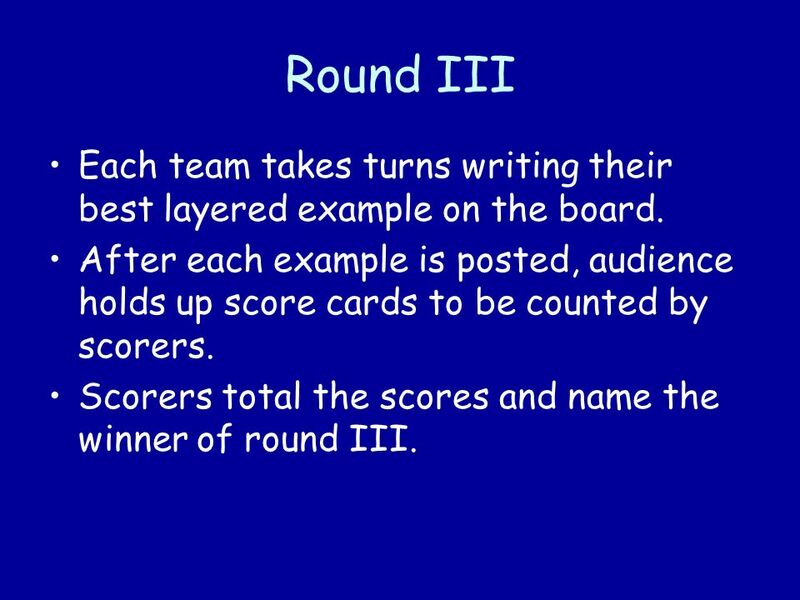 27 Round III Each team takes turns writing their best layered example on the board. After each example is posted, audience holds up score cards to be counted by scorers. Scorers total the scores and name the winner of round III. 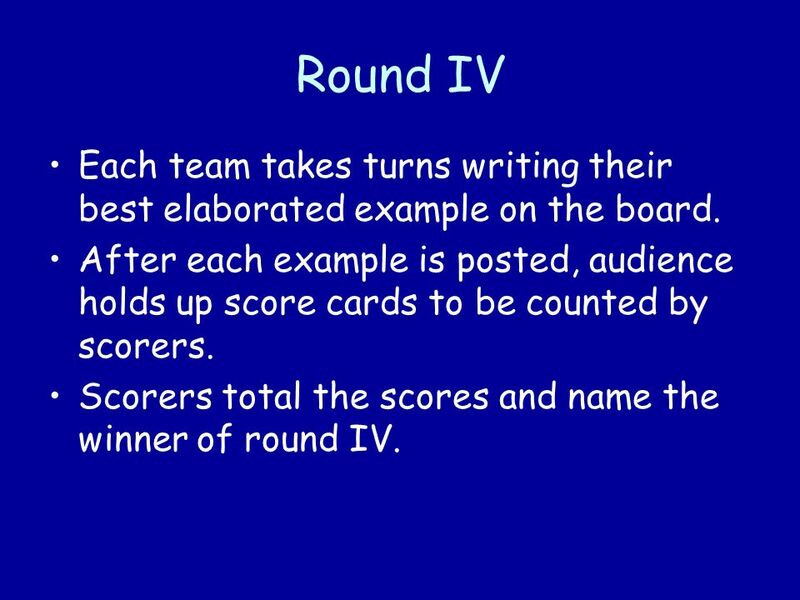 28 Round IV Each team takes turns writing their best elaborated example on the board. After each example is posted, audience holds up score cards to be counted by scorers. Scorers total the scores and name the winner of round IV. 29 Grand Winner Check the group with the most winning rounds. 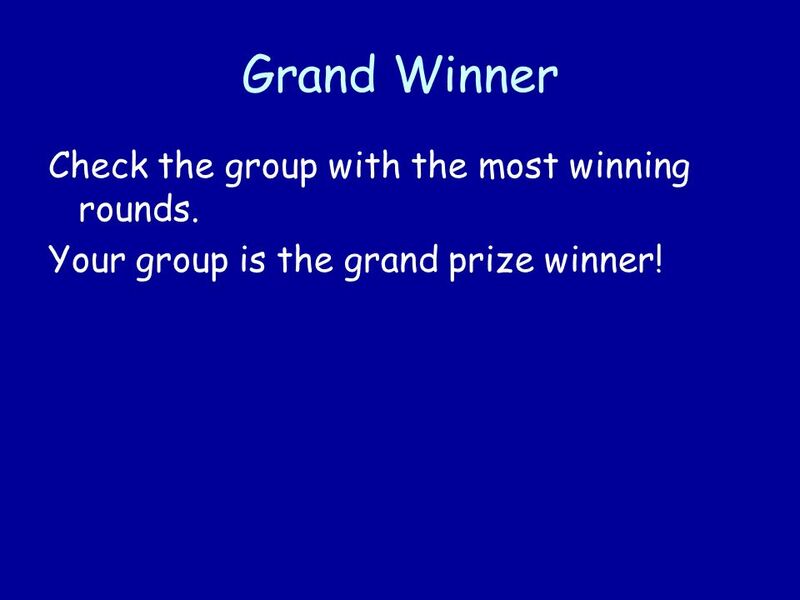 Your group is the grand prize winner! 30 Apply it for a Summative Grade Youve seen the best arguments for and against your prompt. 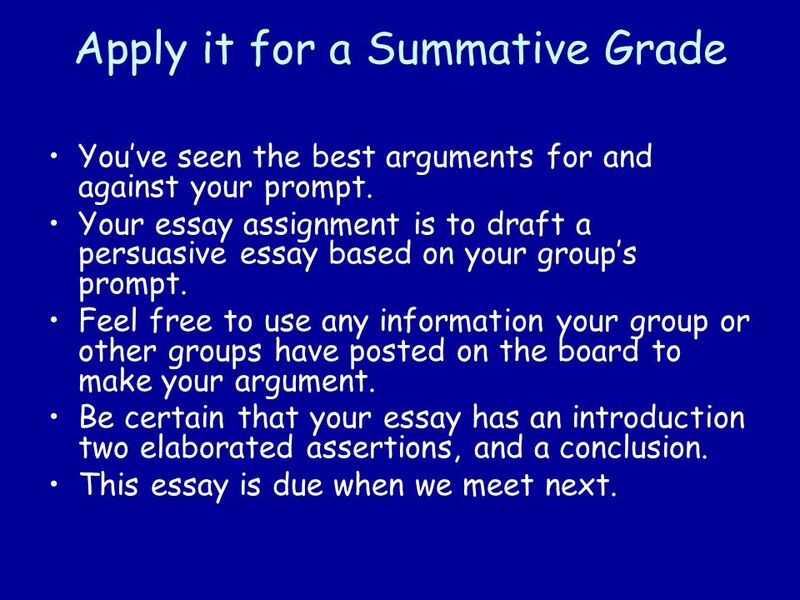 Your essay assignment is to draft a persuasive essay based on your groups prompt. Feel free to use any information your group or other groups have posted on the board to make your argument. Be certain that your essay has an introduction two elaborated assertions, and a conclusion. This essay is due when we meet next. 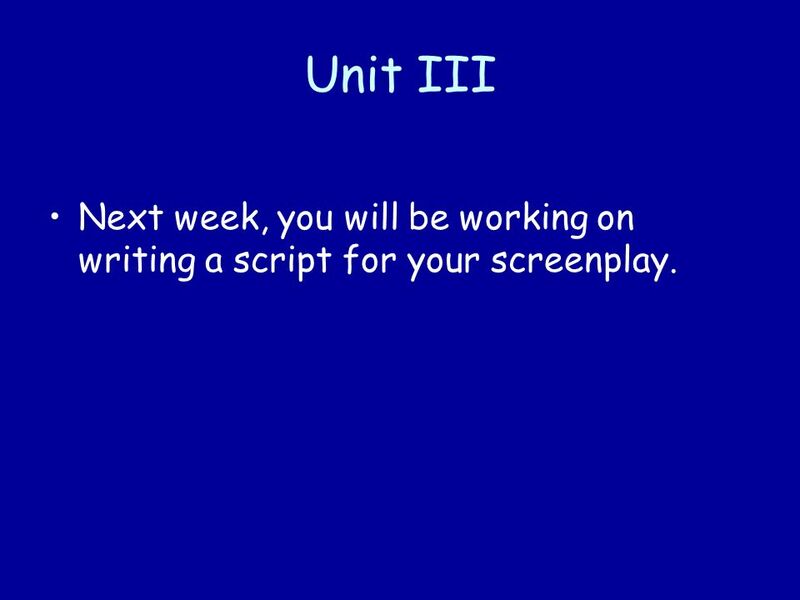 32 Unit III Next week, you will be working on writing a script for your screenplay. 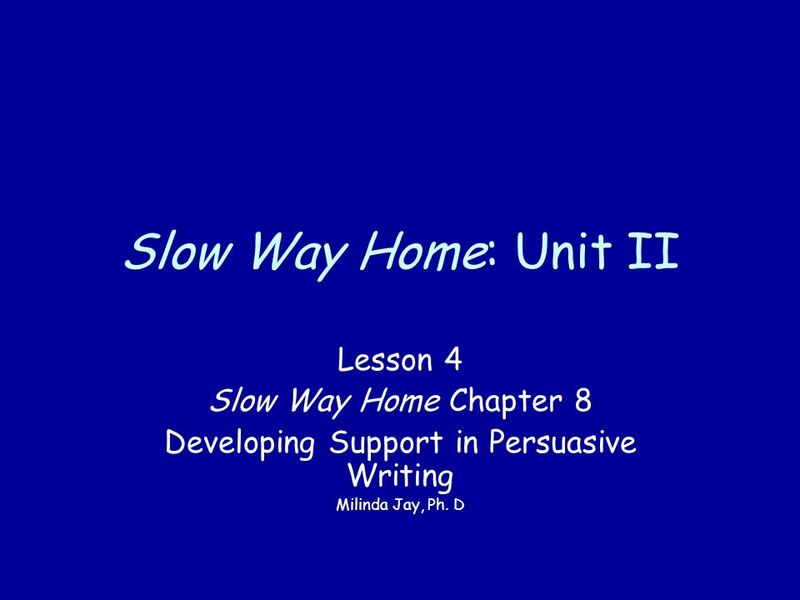 Download ppt "Slow Way Home: Unit II Lesson 4 Slow Way Home Chapter 8 Developing Support in Persuasive Writing Milinda Jay, Ph. D."
Unit III: Lesson II Vocabulary Assessment Part II Milinda Jay, Ph. 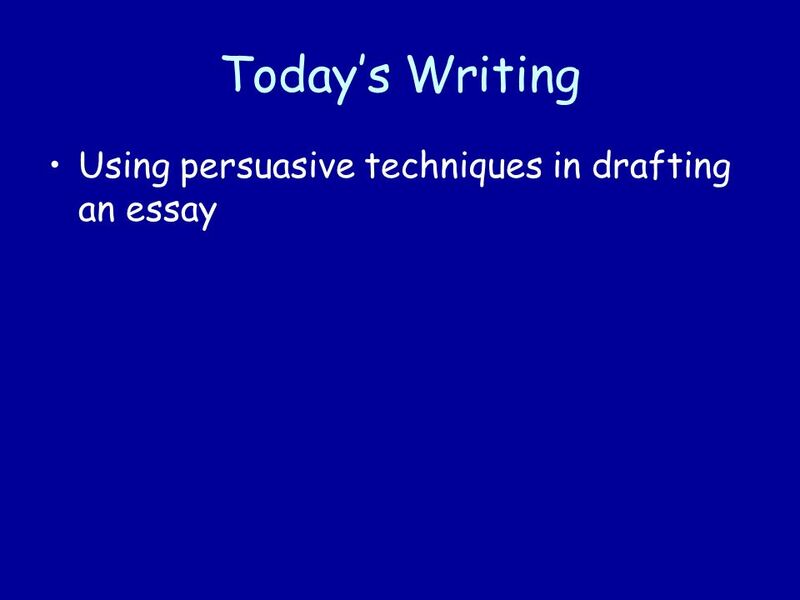 D.
Unit IV: Lesson 2 Slow Way Home Persuasive Essay Assessment Milinda Jay, Ph. D.
Step one: Go to the Stuarts Draft homepage, then to my teacher page. Click on the tab Work Day Step two: Practice writing a 5-Paragraph Essay on the prompt. Welcome Writing All-Stars! Welcome Writing All-Stars! Please find an available seat Please find an available seat Parents: Check your knowledge of FCAT. Slow Way Home: Unit II Lesson 3 Slow Way Home Chapter 7 Pitching Your Story Milinda Jay, Ph. D.
Four Good Ways to Persuade  Objective: Learn the strategies for persuasion and “think like your audience.”  Let’s look at the Note taker sheet titled. 7 th Grade Language Arts. Choose your topic  In some circumstances, especially when you are given a particular essay writing assignment, your topic may. Slow Way Home Unit 7: Assessment Part II. Review of Lesson I Chapters Chapters What does it mean to read as a writer, and how can doing so.